These days it seems like Amazon is really trying to add value to its Prime membership program. Faster, cheaper deliveries, video streaming, music streaming and now free games. Yes, that’s right. Free games. If you're an Amazon Prime member you've probably heard about this, but if you set up an account on the company’s game streaming service, Twitch, you can link it to your Amazon Prime account to become a Twitch Prime member (or you can sign up for Twitch Prime on its own). There are a few benefits to being a Twitch Prime member, including free in-game items and no ads, but the most recent and best benefit is five free PC games each and every month, starting from March 2018. This is a great way to try out some games you’ve maybe seen streamed but haven’t had the chance to buy for yourself, totally free. Even if you’re not planning to play them straight away, it’s worth claiming them in the timeframe they’re available because even when you no longer have your Prime account they’ll be yours to play. Oh, and you'll need the Twitch desktop app too. Twitch has offered free games before to Prime members but this is the first time it’s been formalized into a monthly event so we’ve decided to put together this one-stop shop where you’ll be able to see the games you can get your hands on right now, as well as see the titles that have been featured in previous months. That way you’ll know whether to hold out for it to appear. So, without any further ado, here are the free games with Prime for June 2018. And make sure you check back - we'll be updating every month. If you're able to pass by the chance of playing a Viking RPG entirely for free we commend you. Or pity you. Especially when it's one as good as The Banner Saga. Craft your own story by making choices in conversation and combat as you traverse a wonderfully realised game world. Every decision you make will have an impact on your story as you try to protect a civilisation from a new threat. Hungry for more when you've finished The Banner Saga? You're in luck – here's the sequel for free too. 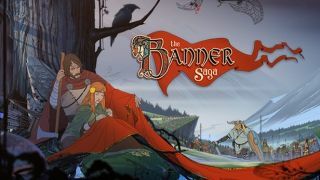 Arguably even better than the first game, The Banner Saga continues your story from the first game and even carries over decisions you've made. Strafe is a very different experience from The Banner Saga but it's excellent on its own terms. It offers thrilling and super-fast first-person shooting across a range of locations in deep space that are filled with enemies for you to gun down with some seriously insane weapons. Looking for physics-defying multiplayer tank battles? You've found them. This game lets up to four players fight it out in couch co-op mode but there's also an online multiplayer mode in beta for single players or duos who are looking for a little more challenge. It's not a lineup without a good puzzle game thrown into the mix. And you can certainly call Tumblestone a 'good puzzle game'. You can play alone or against friends in this classic 'match 3' puzzle game that requires you to think a couple of steps ahead. We'd definitely suggest playing against others for a serious challenge. Get trippy in this classic action platformer from the acclaimed Double Fine studio. This game follows the story of a young psychic called Razputin who's desperate to lend his skills to the elite group of secret agents known as the Psychonauts. Breaking into their secret facility he discovers trouble afoot and it's up to him to save the Psychonauts using his psychic powers. Fantastic name aside, Clustertruck is a platformer set on a highway where players must leap and bound across the tops of unpredictable speeding trucks and never touch the floor. As the game goes on things get even tougher when obstacles are thrown in. Gone Home is a critically acclaimed narratively-driven adventure that shouldn't be missed. Coming home after a year abroad to find your family home abandoned and your family no where to be found, you must explore your home, leaving no drawer unopened to look for clues and unravel the mystery. Looking for a thrilling action puzzler with fluid and satisfying combat? Try Titan Souls where you take up the role of a lone hero armed with a single arrow exploring the world of the Titans that lies between our world and that beyond it. High Hell is a wild and fast first-person action shooter and if that's not enough to convince you maybe the idea of saving sacrificial goats, razing drug labs and blasting your way through some truly absurd levels will. I, Hope is a visually stunning game with a poignant story that explores cancer in childhood while managing to be uplifting and encouraging. Tales from the Borderlands is probably the stand out title from this month's offering and it still stands as one of the best titles Telltale Games has produced. Based on the Borderlands series, it takes players on an episodic narrative adventure. The comicbook style visuals are just right and the writing and characters hit the comedy buttons just right. Developed by SMAC Games, Tokyo 42 is an isometric open-world shooter - think Monument Valley with guns. The game sends you into a dark underworld of assassins in a futuristic Tokyo. Combining puzzles, stealth, shooting skills and undeniable visual style, Tokyo 42 is an enjoyable and challenging game. You have the option to play through a single-player story mode or engage in online multiplayer modes so you won't be short of things to do. Kingsway is a clever indie title that will challenge you and make you laugh all at once. One for RPG fans, this game has you manoeuvre an operating system to manage your adventure. Enemies take the form of pop ups, your inventory will be distributed across file folders, quests are emails and death is permanent. It's an entirely new way to play the classic RPG. Another excellent free addition. Steamworld Dig 2 is a 2D platformer set in a steampunk Wild West which sees you mine underground for treasure and secrets while avoiding enemies and traps. It's better than the original and you don't hear that often. You could probably guess from the name, but Dub Wars is a music game which combines top-down shooting mechanics with electronic dance music. Using music as your weapon, you have to fire to the rhythm of each song and survive with the skill of your ears and sense of timing. Superhot is an indie first-person shooter that received a great deal of critical acclaim for good reason. Its interesting twist on the genre sees time stop when the player stops moving which makes shootouts a whole lot more interesting. Oxenfree is a critically acclaimed supernatural thriller which follows a group of friends through a coming-of-age story on an island with a ghostly mystery. This 2.5D adventure has an addictive story, wonderful characters and an atmosphere that feels very Stranger Things. If you like tactical stealth games then you’re probably going to like Shadow Tactics. Set in the Edo period in Japan, this game has you take control of a team of five deadly specialists who must help a new Shogun enforce peace. Each member of the team has their own skill and it’s up to you to make them work together well in order to successfully infiltrate areas and defeat enemies. Mr Shifty is a top-down action game that sees your take control of a teleporting hero. It’s up to you how to use Mr Shifty’s skills in order to defeat his enemies but you’ll need to be smart about and use a mix of stealth and all-out action to win. Do you like tabletop board games like Dungeons and Dragons? Then you might want to take a look at Tales from Candlekeep. Inspired by these roleplaying adventures, this game is turn-based dungeon-crawler in which you must take up the role of an adventurer fighting through the dangerous labyrinths and jungles of the peninsula of Chult in order to reverse a deadly curse.